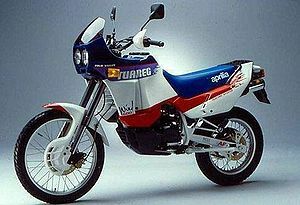 Unfortunately, Italian skill with the paint box was not enough to exact any respect from the neolithic types who handled the Tuareg during its trip from Northern Italy to Northern England, and it arrived at the Manchester base of importers Aprilia UK with the extensive (and expensive) bodywork bashed to bits. Replacing it was no problem, except that the only spare plastic was in last year's colours. So it was that we didn't really get a new bike to test at all: last year's bike, last year's paint and a nagging suspicion that we were being fobbed off with a machine that, although deemed to be no longer up to scratch for the rest of Europe, was an easy option for the UK market compared to the hassle of homologating the new model. Add to this a gremlin attack on the starter solenoid and a broken connection in the wiring loom as a result of the frequent removal of the tank and it would have been easy to write the Tuareg off as another example of Latin flair for design let down by poor quality control. That would not really have been fair — a bike can't choose who handles it in transit, and I am sure that the problems we had with the electrics all had their root in the original damage to the bodywork. Besides, it is easy to forgive almost anything just to have that beautiful Aprilia-spec Rotax burbling and clattering away underneath you. A very long way underneath you as well. I am not over-endowed in the leg department, although when standing up they are more or less the right length (they reach the ground and don't have to bend at the knee to keep me down to the right height). On the Tuareg I can only reach the floor by slipping almost all the way off the seat, which I find a little annoying — you don't need a huge seat height to have good ground clearance. Still, even that has its good side, since once aloft you have a fine view of the countryside. I doubt, though, whether that's the real reason for the elevated perch: I believe that it's so you have a good platform from which to descend at speed on the kick-start, should you be foolish enough to allow the battery to go flat. I liked the bike when we first got it. After all, it was still the sludgy end of winter, and hardly the weather for a sports bike, so it didn't really matter that it would only do just over the ton, sat on over-bouncy suspension and had too many green idiot lights. It was comfortable, even up to five-hundred-miles-a-day level (I tried this), and quick enough to be fun whilst not so fast as to remove all hopes of licence retention. It returned around sixty to the gallon and was quite happy to point its front wheel at the sky with the minimum of effort. Then two things happened to make me change my mind: firstly I was unwise enough to attempt a spot of off-road riding, and secondly the roads dried out. I never seriously expected the Tuareg to be any good on the dirt, but I thought it would be fun to have a go. It wasn't. A combination of high seat, short legs and top-heavy weight distribution made for several uncomfortable moments when I couldn't reach the ground quickly enough to avoid disaster. The lack of any dirt ability was not really a significant black l mark on the Aprilia's character, j but its off-road pretensions i dictate a suspension and tyre i choice that has no function ; beyond pure pose-value, and what it really needs is more road orientated geometry, a smaller, wider front wheel and some proper tyres. In short, it needs to be the Pegaso that the UK isn't going to get. On the road, the narrow twenty-one inch front tyre felt vague and too inclined to wash out if it was turned in hard. Shifting body weight forward helped, but the tyre didn't seem to give any feeling of what it was up to beyond a distant squirming sensation. Given my new-found dislike of the Tuareg's handling characteristics, I was less than enthusiastic when it was the only bike available to recce Cadwell prior to taking the NWS GSX-R750 (p.52) for its track test. My misgivings weren't helped by photographer Kenny P. chortling away to himself about where he could get the best crash shots, and the fact that the marshal at the club circuit hairpin clearly couldn't decide whether to laugh or whether to cross himself and take cover. I made a last effort to improve the steering by dropping the yokes over an inch on the forks and went out hoping it would break down so I could go home. Sixty laps later I'd changed my mind again, a phenomenon not unconnected with the fact that I had learnt more or less which way the circuit went, For sale, one Aprilia Tuareg, suit pole vaulter or retired mountaineer. Strangulated hernia forces sale. turned the edges of the tyres blue, scraped the pegs through Charlies and overtaken a GSX-R through the Gooseneck. I had also fried the new-for-'91 twin disc front brake with repeated four-fingered abuse at the hairpin, and the clutch was a little soggy from the heat, but the motor still ticked over quite happily in between sessions and would almost pull the ton on the back straight. It would have continued to do so, too, had the sight of an MZ racer sliding across Mansfield not served as a timely reminder that it is better to pack up before tiredness and bravado lead you to throw it all away rather than immediately afterwards.It seems that my desperate attempts to modify the steering characteristics actually worked, as there were no problems with the front washing out, even entering bends faster than I would have liked due to the rapidly disappearing front brake. The only disadvantages are a marginally reduced inclination to wheelie and a side-stand that already holds the bike too near the vertical. Front Suspension 40mm forks. 210mm wheel travel. This page was last edited on 1 February 2011, at 22:47.